On Wednesday, April 11, 2018, The Society hosted H.E. 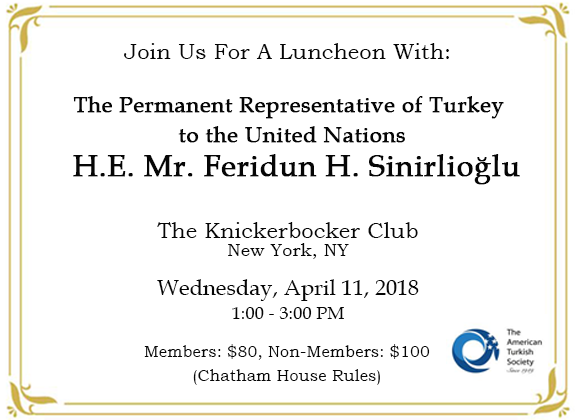 Mr. Feridun H. Sinirlioğlu for a private luncheon lecture at a private club in Manhattan. The topic is "Turkish Foreign Policy", as Ambassador Sinirlioglu has a depth of experience in foreign affairs. Before assuming his current post in 2016, he previously served as the Minister of Foreign Affairs from 2015 and the Undersecretary for the Ministry of Foreign Affairs in Ankara since 2009. See Ambassador Sinirlioğlu's full biography here.